210 years ago in 1805 – an inquisition was taken at Lavendon before one of the Coroners for the county of Buckinghamshire, on the body of Mary Simcoe, who was found dead in a field adjoining the town. It appeared that the deceased was subject to fits, and happening to be seized with one while alone, she was strangled by a black ribbon which she wore about her neck. Verdict—Died by the Visitation of God. 170 years ago in 1845 – an Inquest was held at Olney in to the death of William Warren age 14 years. On 19th August he had gone to Lavendon Mills for the purpose of fishing. Despite cautions by Mr Perry and his son, the deceased persisted in mounting a pony. Once on the pony he gave it a blow with his hand and the pony turned, throwing the deceased on to the ground and landing on his head. He was conveyed to the mill house and, despite every assistance, died on the following Monday – verdict accidental death. 160 years ago in 1855 – a sermon was preached on Wednesday, 26th September, by the Right Reverend the Lord Bishop of Oxford, in the parish church of Lavendon, and a collection was made in aid of the funds for the National and Infant Schools recently built in the village. 120 years ago in 1895 – Newport Pagnell Petty Sessions: The Vaccination Prosecutions*. There was a good deal of excitement in Newport when several lots of furniture seized from residents in Olney, Lavendon, etc., for noncompliance with the Vaccination Laws, were sold by public auction. Prior to the sale a public meeting was held on the Market Hill and addresses condemnatory of Compulsory Vaccination were given. A resolution was unanimously carried protesting against the action of the Newport Board of Guardians, in instituting prosecutions. People had been asked not to bid at the auction, but several persons bid for their own goods, and one, who bid contrary to the desire of those present, was gone for, having to be escorted by the police, and to take refuge in the Auction Hotel. The sale realised about £7, or one-third of the expenses involved by the prosecutions. Mr F Green of Lavendon was issued with a fine or seven days prison in default. (The following month he was reported as being in prison). *(Wikipedia) Note: Under the Vaccination Act of 1867, the poor-law guardians were to control vaccination districts formed out of the parishes, and pay vaccinators from 1s to 3s per child vaccinated in the district (the amount paid varied with how far they had to travel). Within seven days of the birth of a child being registered, the registrar was to deliver a notice of vaccination; if the child was not presented to be vaccinated within three months, or brought for inspection afterwards, the parents or guardians were liable to a summary conviction and fine of 20s. An 1873 Act made vaccination compulsory. 90 Years Ago in 1925 – Newport Pagnell Petty Sessions: Bad Language. Edward Clark, a labourer from Cold Brayfield, and William Weed, a gardener from High Street, Turvey, were summoned for using indecent language at Lavendon on Saturday, August 22. PC Trevener of Lavendon said he heard the defendants 60 yards away. Police-Supt. Callaway pointed out he had recently received many complaints from Lavendon of the language used late at night there by young men. The Chairman added that he was aware of the language being used in the district, and it was regrettable that people could not go out for a walk without using or hearing such language. Weed was fined 10s. and Clark, who did not appear, 12s. 6d. 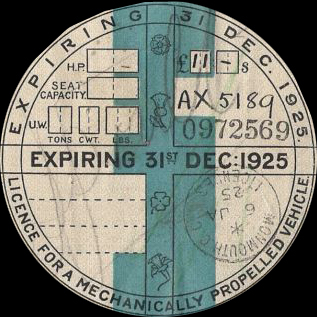 Road Fund License or tax disc of 1925 [Wikipedia]. Charles Edward Cook, a confectioner of Rushden, was summoned for using a motor cycle and sidecar with the Road Fund Licence not in a waterproof holder at Lavendon. A fine of 5s. 6d. was imposed. 70 Years Ago in 1945 – Lavendon New Village Hall Fund: The annual public meeting to consider accounts and elect officers for the coming year took place at the Schools on 12th September. Everybody was cordially welcomed. Forces Fund: A resolution, to replace the Forces Fund with a Welcome Home Fund on 31st December next, was carried at a meeting of the Lavendon District Branch of the British Legion, held at the Horseshoe Inn. All men and women serving in H.M. Forces, and those demobilized during this year, will receive an equal share of the present Forces Fund, until it is wholly expended. When this has been done, other organizations will be invited to cooperate with the Legion to form a Village Committee, who will institute the Welcome Home Fund. The Branch Secretary, Mr. R. Panter, was instructed to notify the Parish Council accordingly, who have already promised their support. Parish Council: It was resolved to make immediate arrangements to entertain the children to a Victory tea party, etc., shortly. Posted on Tuesday, 1 September 2015 by Editor •	This entry was tagged Timeline. Bookmark the permalink.